Sometimes the benefits of being annexed by a neighboring city are not immediately clear. When the City of Kirkland closed our park at Juanita Beach and forgot to reopen it, for example, I failed to appreciate it. I was also puzzled when our garbage and recycling bins were taken away last week. But this week the bins were replaced with new ones, and they came with a surprise. 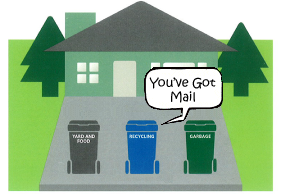 You recently received a City Service Guide in the mail that we hope you find to be a helpful and useful resource. Unfortunately, the 2011 Property Tax Comparison on page 23 is incorrect; please replace it with the correct version shown below. Someone across the street from our office used to hang a fat-lettered sign inside their 5th-story office window that read: WARNING: SPEED TRAP. The sign alerted drivers at the intersection of NE 8th and 112th Avenue NE in Bellevue that they were being watched. But it isn’t exactly a speed trap. The intersection is complicated mess, with drivers entering from more 19 lanes of traffic including a 3-lane offramp, plus inconspicuous no-right-on-red signs and an onramp to top it all off. With every green light and so many drivers trying to navigate through the maze of lanes and restrictions, someone is bound to break a law. And most mornings a Bellevue motorcycle patrolman is there to catch them. Up on the 8th floor of my office, across from the warning sign, I am used to the brief blip blip of the siren that tells me someone is being pulled over. I wheel my chair over to look down with curiosity at the misfortune of others, or Schadenfreude if you are German. 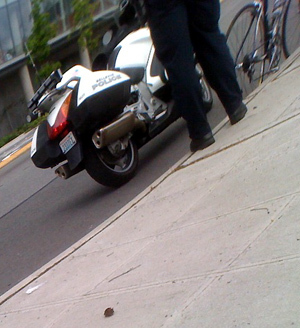 The Bellevue police can be more disruptive to workplace productivity than Spider Solitaire. But occasionally, the routine is broken. One overcast day last week things did not go as planned for the Bellevue police. There was no blip blip for an interminable 10 to 15 minutes of green lights. The silence got my attention. I looked down and saw a motorcycle officer spying from his hideout. Ponch and John had been reduced to John with paunch. No driver was willing to commit an infraction. He looked bored. So at last, he drove his motorcycle through the crosswalk and nabbed a middle-aged woman waiting for the light to turn green. She was on a bicycle. As a cyclist who often deserves to be cited, this really caught my attention. How could you get a ticket for just waiting at a red light? I ran down the stairs, camera phone in hand. I snapped a bad photo of the legs of the officer as I walked by. And then, when it was all over, I found an excuse to talk to both the cyclist and the officer. She seemed a little bewildered and swore she had not done anything wrong. But for a trained officer, the offense was obvious: The cyclist waiting for a light to turn green was “splitting lanes.” At this particular intersection, that means that she was waiting on the far right of the through lanes and allowed a car to pull up alongside her. She thought she was being polite by not getting in the way of cars waiting to go through the intersection. But she should have been impolite. By allowing a car to pull up next to her in the same lane, she had violated a law designed to keep motorcycles from driving between cars on the freeway. The last part of my snooping was to find out how much the cyclist had been fined for letting a car pull up next to her. Fortunately for me, the Washington State Patrol has an active and helpful Twitter account. And the answer is: $124. Sometimes it is best not to share the road.